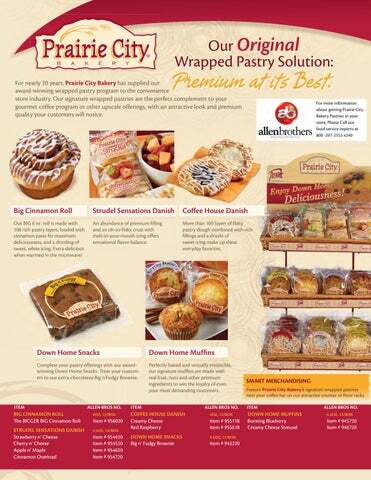 For nearly 20 years, Prairie City Bakery has supplied our award-winning wrapped pastry program to the convenience store industry. Our signature wrapped pastries are the perfect complement to your gourmet coffee program or other upscale offerings, with an attractive look and premium quality your customers will notice. Our BIG 6 oz. roll is made with 108 rich pastry layers, loaded with cinnamon paste for maximum deliciousness, and a drizzling of sweet, white icing. Extra-delicious when warmed in the microwave! An abundance of premium filling and an oh-so-flaky crust with melt-in-your-mouth icing offers sensational flavor balance. More than 100 layers of flaky pastry dough combined with rich fillings and a drizzle of sweet icing make up these everyday favorites. Complete your pastry offerings with our awardwinning Down Home Snacks. Treat your customers to our extra-chocolatey Big n’Fudgy Brownie. Perfectly baked and virtually irresistible, our signature muffins are made with real fruit, nuts and other premium ingredients to win the loyalty of even your most demanding customers.